Christmas cupcakes There are 10 products. 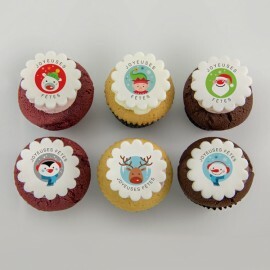 Happy Holidays Cupcakes with edible Santa, reindeer, elf, pinguin, polar bear & snowman illustrations. Only available in store or for delivery in the Greater Montreal region. 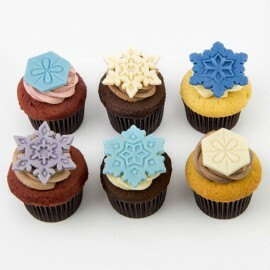 Christmas cupcakes with colorful Christmas icons' illustrations Only available in store or for delivery in the Greater Montreal region. 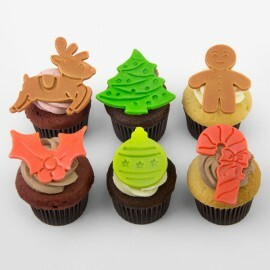 Christmas cupcakes with edible Santa, reindeer, elf & pinguin illustrations.Only available in store or for delivery in the Greater Montreal region. 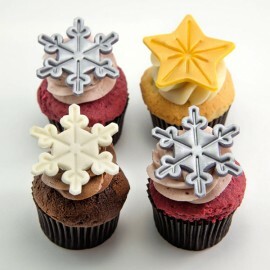 Merry Christmas cupcakes with edible illustrations.Only available in store or for delivery in the Greater Montreal region. Available in French or English. 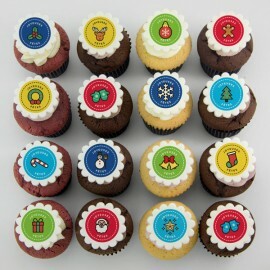 Christmas cupcakes with colorful Christmas tree illustrations Only available in store or for delivery in the Greater Montreal region. To get through the long and cold winter, get some warmth in enjoying our pure butter cupcakes decorated with little penguins made of marshmallow fondant! 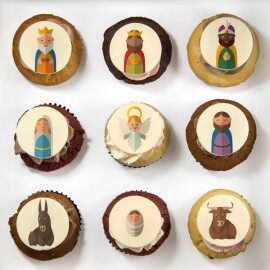 Nativity Cupcakes with edible illustrations of the Nativity scene characters will put some magic on your Christmas table (and why not under the Christmas tree!). Only available in store or for delivery in the Greater Montreal region.